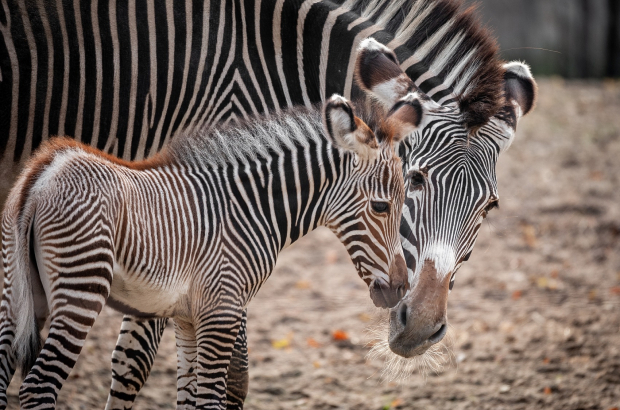 Planckendael animal park in Mechelen has welcomed a new baby zebra. The baby, called Tamu, was born 10 days ago, but the birth was just announced this week. It’s good news for the park, which began a breeding programme this year when it introduced the stallion André to two mares, Luisa and Nele. Tamu – the name means “sweet” in Swahili – is Luisa’s baby, but Nele is also pregnant. There are three species of zebra, and the Planckendael group are of the Grévy’s zebra species, native to Kenya and Ethiopia. Of the two endangered species, Grévy’s is the most threatened, with the wild population decreasing from 15,000 in the 1970s to 3,000 today. Because of the temperature, both Planckendael’s mother and baby have been inside, though the park said that if the forecast for slightly warmer temperatures this week is correct, they could make an appearance for a few daylight hours this week. There are now six members of the Grévy’s zebra family at Planckendael. In addition to the two aforementioned mares and new dad André, there are two old mares, Fanny and Asra. Those two are in their mid-20s, about the life span in the wild, though in captivity zebras can live up to 40 years.